On Thursday the 21st, I made the decision to skip womans chorus (something I don’t do on the regular I promise!) and go see a famous poet that one of my Professors spoke of. My Professor, a brilliant Professor of Arabic, spoke very higely of this poet. His words compelled me to go. And although I knew nothing about the man I was going to see and did not speak Arabic, I had a feeling that this event would be special. At 3:20 I walked into the Union Theatre with B, one of my best friends here at UT. The reading was set to start at 3:30 and as I surveyed the crowd, I realized there where a lot more people than I had expected (good to know people some still care about the arts!). As we sat down, I began to notice my surroundings in great detail ( As many of you know, I am an avid people watcher so it really shouldnt surprise anyone ahah). I noticed the girl next to me in a black burqa with the red under her eyes, the caucasian woman in front of me speaking fluent Arabic, the smallish man with gray hair on the stage. I found myself fascinated by these things, and for the next couple of minutes I found myself day dreaming about burqa’s and white Arabic speakers. But, I was quickly snapped out of my dreams when one the Arabic Professors stepped up to the mic and began to introduce UT’s special guest. The professor dove into what was a lengthy introduction, noting the guests numerous awards (he almost won a nobel prize!) 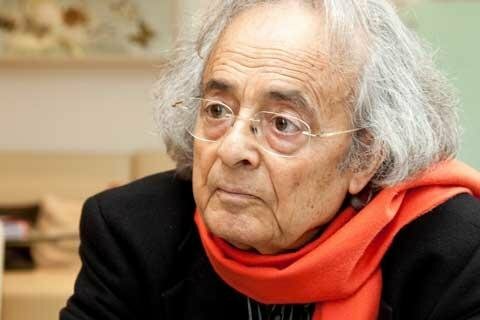 teaching positions in Lebanon and France and his profound impact on Arab poetry. And as this professor continued to speak, I realized two things: 1. I’m not very good at understanding Arabic accents and 2. Although his accent was difficult to understand, I gathered from the introduction that this man was a big, big deal. Adonis was a small, neat looking man with curly gray hair that sat just above his ears. He was born Ali Ahmed Said in Al Qassabin, Syria and is considered to be the Arab world’s greatest living poet. Adonis had come to UT today to recite his poetry and answer a few questions. He was accompanied by a translator, a man whose name I unfortunately could not pronounce and therefore don’t remember. He stood in front of a small podium and began to read. The words poured from his mouth. His speech was smooth and engaging﻿.﻿﻿﻿ At one moment, his words would be full of passion and deep emotion, the next a calm whisper. I had no idea what he was saying, yet somehow I understood, even before the translator opened his mouth. He spoke of an ancient time, a time when God’s ruled the earth and man was just a mere mortal. He spoke of the elements, of Earth. In his poem, “September 11, 2001 B.C” he spoke of a struggle, of a machine. He said,”How weak a house must be when it is dictated by the ink of New York.” His words resonated with me. Adonis was simply brilliant. I thank God that not only was I exposed to his poetry and was lucky enough to have heard it come straight from the poets mouth. UT and the Department of Middle Eastern studies really deserve a big thanks. It’s not everyday that you hear the world’s greatest Arab poet. It’s sad that more students did not take advantage of this opportunity; the man is old, he may not come again! Take advantage of these events people!! This is where real knowledge comes from.